Make a one-time or monthly gift for animals. Make a general donation to MFS using PayPal. 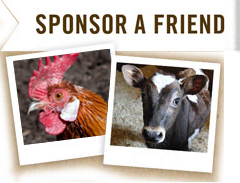 Sponsor a rescued farm animal at MFS. Donate a much-needed item from the MFS Wish List. Donate vehicles and services, Amazon Smile & more.